It's finally there. Visa application and approval for Turkey trough internet. You can pay with you credit card and no queues anymore at the Turkish customs. Turkey has announced a e-visa application on internet. 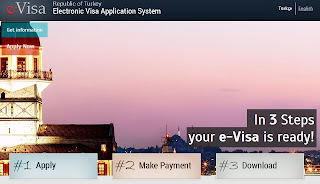 The website is available through: E-visa, the electronic visa site of Turkey. The website gives the possibility to pay and print your visa. The next step is to show your printed version at the Turkish customs. No more visa queues at the airport. The internet site is accessible via E-Visa. A tourist visa is valid, as shown in our previous publication: New visa regulations for tourists in Turkey. Furthermore, a visa is valid for the applicant. It is not possible to transfer or to sell your visa document. More information on the website of the Ministry of Foreign Affairs.